Paso Robles, located halfway between Los Angeles and San Francisco, is truly a magical, trendy and bustling destination! I recently had the pleasure of spending a wonderful weekend there and was blown away by how much this emergent city has to offer. While the eateries are incredible, the main draw is definitely the wine – and boy does Paso Robles deliver. It’s honestly on par with Napa – but at a much more wallet-friendly price. 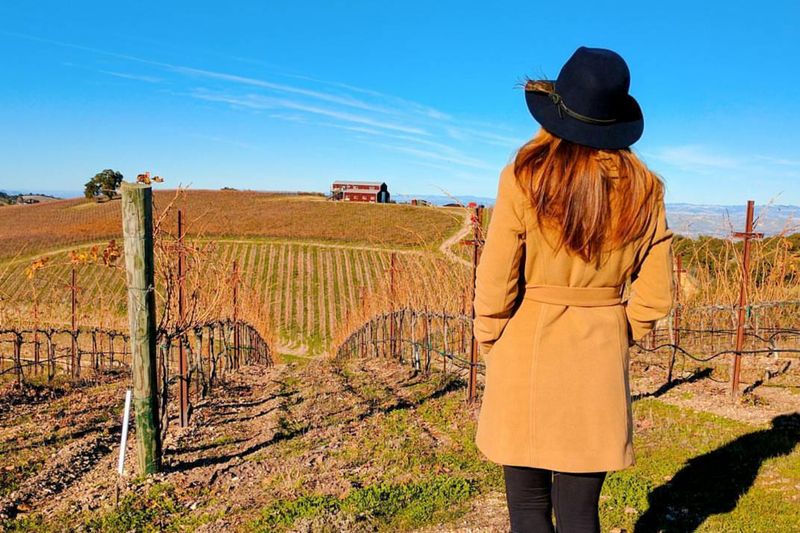 Without a doubt, the next time you are craving a memorable California wine country getaway but without the aloof No Cal attitude and latitude, I suggest you use my Paso Robles travel guide, head to Central California and prepare to be wowed. 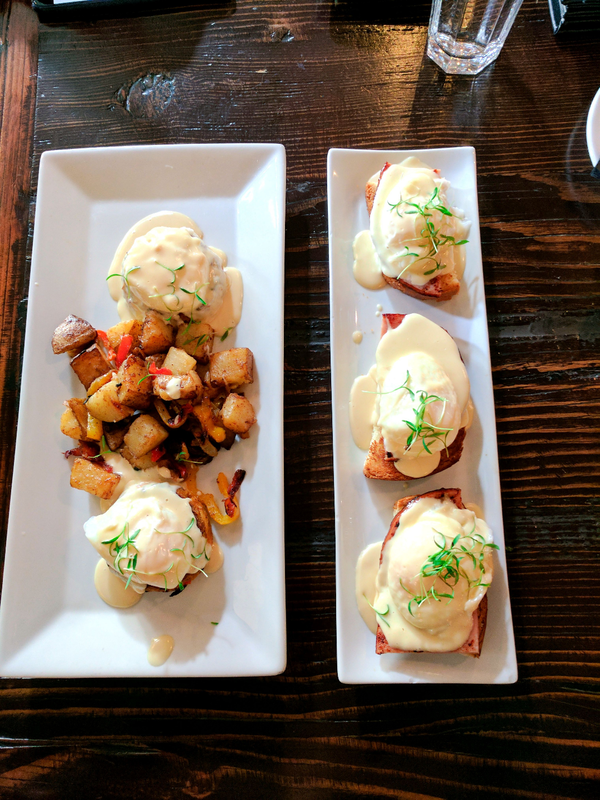 I had some of the best meals of my life in Paso Robles! There is an eclectic array of dining options and super friendly service staff and owners. Everything here is truly farm to table and if you enjoy a good wine pairing with your courses then you are in luck. I love a good 3 hour meal and super-appreciated how knowledgeable and genuinely happy everyone was to walk me through my options and make personalized suggestions. My husband and I drove up from LA Saturday morning in time to kick off our trip with a delicious lunch at Artisan. They have a creative cocktail menu, so be sure to give that a gander if you’re not quite ready for wine. I tried Abalone for the first time and it was so sweet, tender and tasty! That night we had dinner at Villa Creek and thoroughly enjoyed the vibe. I must say the beef short ribs are not to be missed and don’t hesitate to splurge on dessert. You deserve it! For Sunday brunch we ate at La Cosecha. 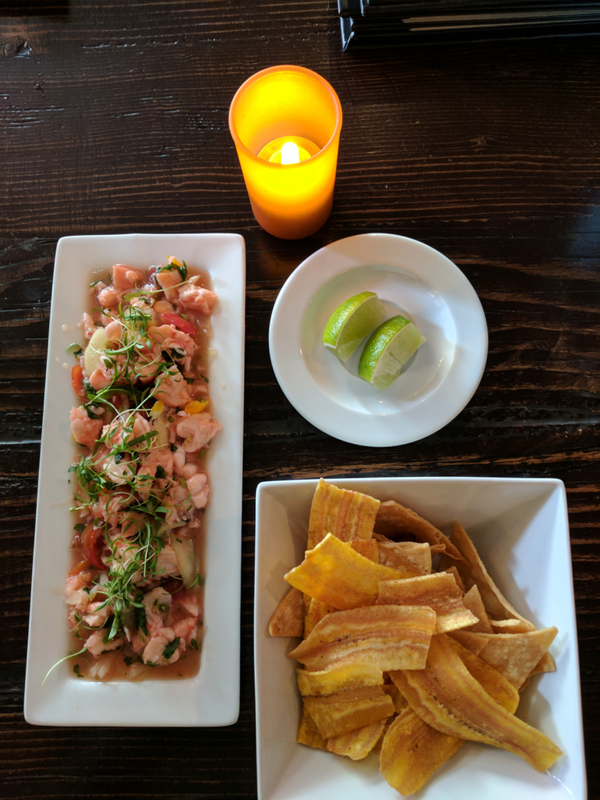 They had an amazing live band entertaining the weekend crowd and the yummiest fresh ceviche served with crispy plantain chips. It was clear this spot was a fave with locals and I just sat back and enjoyed the scene. For our final meal we had some absolutely incredible Mexican food at Fish Guacho. We were starving after a long day on the wine trail and exploring tin city, so this meal hit the spot perfectly and the portions were generous! What a lot of people might not realize is that of course there are some incredible wineries, but there are also quite a few other interesting options for the non-wine drinkers. First let’s start with where to drink wine and it doesn’t get better than Alta Colina Winery. Alta Colina sits on 130 total acres with 31 acres planted. It is family owned with less than 10 employees, so they are able to have fun and experiment a little more. Plan ahead and book a tour of the actual vineyards with your wine tasting. You’ll get the family treatment learning the history of the winery with the owners and enjoy your wine tasting on property with the most gorgeous scenic view! I absolutely adored learning the wine names, which honored family members, and I honestly did not taste one wine I did not want to take home with me! 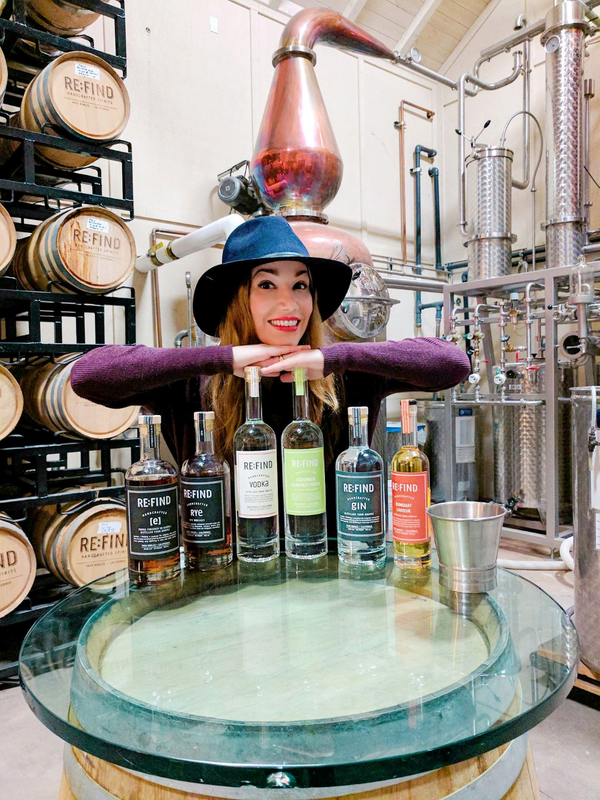 Next door you must pay a visit to Re:Find Distillery to try their Re:Find Handcrafted Vodka and Re:Find Handcrafted Gin, spirits made with premium grapes from the Paso Robles wine region. I took home a couple of bottles of their cucumber vodka, which I’ve deemed my alcoholic spa water. Re:Find Distillery founders Alex and Monica Villicana are total trailblazers and the first to utilize premium Paso Robles-grown grapes as their base, a luxury too expensive for most distilleries producing spirits from potatoes or grains. I learned you can make any liquor out of a grape base, but it is much more expensive. They have a great selection of whiskies, a barrel finished vodka and some other fun goodies to try, so plan on spending some time there. They were also the first location in the region to have a distillery and winery, and now there are nine so you, of course, have to try the wine too! If you are looking for an area to get dropped off and spend the day, then Tin City is perfect! Tucked behind a service road off Highway 101, Tin City looks like an industrial park. Once you start walking around you’ll discover it’s full of awesome wineries, craft cider and even brandy! I suggest starting at Onx Wines with a tasting. They have spectacular wines and a nice indoor and outdoor setting. Make sure to try the L’autre Femme, a viognier 62%, sauvignon blanc 38% blend. Next head over to Tin City Cider for some awesome craft cider!! Tin City Cider hasn’t been open that long, but the place was packed! That’s because according to owner and winemaker Mikey Giugni along with co-owners Curt Schalchlin and Andrew Jones, ‘the thing we’re doing here is we have no idea what we’re doing here.’ Mikey went to Tazmania to learn how to make sparkling wine and the workers were making cider and taught him. I really enjoyed my tasting and there is a fun atmosphere there. I suggest you get to Tin City Cider early because the taps do run out on the most popular ciders of the day! Now you’ve got the perfect excuse to drink before noon! After you’ve had your fill of cider, end your day with a brandy tasting at Wine Shine. 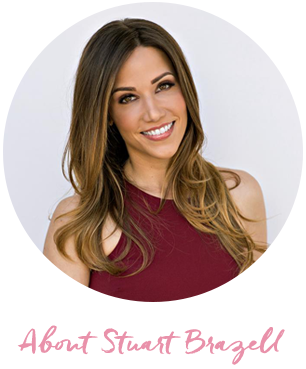 I personally didn’t know I was a brandy drinker until I tasted Wine Shine‘s unique and innovative flavors. They source grapes from the local wineries in Paso Robles to make their artisan creations. And if you like Manhattans, be sure to take home a bottle of their Manhattan Project. They created their own truly craft version of this drink that has been blended and aged prior to bottling. Each version uses both a bitters and vermouth that have been crafted at Wine Shine. All you seriously need to do is pour it over ice and you are good to go. And by the way the crew here are all total entertainers, so get ready for lots of laughs and unpretentious hospitality! Paso Robles has a wonderful array of hotels to choose from depending on your budget and the vibe you are going for. I personally like to be in the middle of all the action, so I chose the Paso Robles Inn. You are right in the center of town and can walk to all the cute shops and restaurants. Plus the Paso Robles Inn has so much to do on property. Enjoy a morning strolling the grounds, sitting by the koi pond, grabbing a glass of wine in the lounge and a good book from the Little Free Library, or take a dip in the outdoor heated pool. If you’re looking for a truly unique and indulgent experience, stay in one of their newly remodeled winery themed deluxe mineral spa rooms. I stayed in the Firestone suite and loved the themed décor, fireplace and amazingly my very own patio with private mineral spa tub. When you are looking to mix things up from food and wine, there are countless options of things to do in the area. If you are an art lover then you must pay a visit to Studios on the Park, a nonprofit open studios art center in the heart of historic downtown Paso Robles. Not only are you able to enjoy the gallery, but you can also join classes and create your own art like a watercolor painting. If you’re an adrenaline junkie, then zip lining in Santa Margarita with Margarita Adventures will satisfy your fix! I found this experience to be absolutely exhilarating! Spending time on the oldest working ranch in California and zip lining over Pinot Noir fields was pure magic. I spotted an array of wild animals, screamed with glee and soaked in the fresh air. Oh, and I crossed this crazy bridge!! And be sure to get in a wine tasting across the street at Ancient Peaks Winery. Their Renegade and Oyster Ridge are must tries and they have a great cheese plate! You should also take a drive up the coast to San Simeon and spend part of your day at the meticulously crafted Hearst Castle. I was blown away by the grandeur, beauty and history of this historical landmark. Browse the tours here and book the one that interests you the most. Since I visited around Christmas time, I decided on the Grand Tours to enjoy the gorgeous holiday decorations. You may be on a tight schedule, but you’ll even get some time afterwards to explore the beyond beautiful property and lush gardens on your own. If you’re lucky enough to be there at day’s end, you’ll be blessed with insanely spectacular sunsets over the expansive Pacific! For you Hollywood history and movie buffs, visiting the Hearst Castle will be a real treat (don’t forget to watch Citizen Kane before you go)! I hope you have enjoyed my Paso Robles travel guide. I personally can’t wait to go back to this dynamic destination! The food, wine, cocktails, people and experiences are top notch. There really isn’t a bad time of year to go, so pack your bags and have a blast! 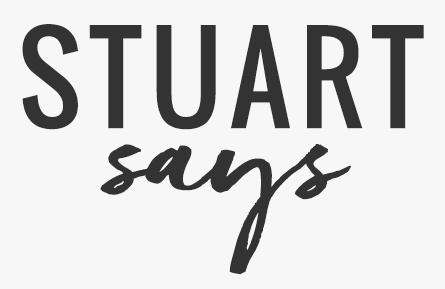 Tell ’em Stuart sent ya! I’ve never heard of Paso Robles before, but now I’m sold! I definitely want to check it out the next time I’m in California! I’ve never been to Cali before, but am planning a trip next year—hubby and I may need to venture to this destination!! Really love this post! You gave me another destination city to visit on the weekend. This place looks so much fun. Thanks for sharing your experience with us. This is a great guide! Love all of the recs. i used to do girls trips here!! love this travel guide! I live in SF and you’re making me want to visit! I should seriously stop by Paso Robles! I always pass by it!! Great Post! This place looks amazing! And you can be my travel guide when I go ha! You seem to know it all, and really pegged some great places! The photos are beautiful, and I want to start eating and drinking RIGHT NOW! Oh, my goodness! I have driven past this place but have not had a chance to explore and visit like you! I am so inspired and it is such a beautiful area! What a great travel guide! The food all looks so yummy and all the activities you did look so fun! Also I need to comment on how flawless your makeup looks in all your pics despite being so active during your travels. I just loved reading this travel guide. So many great tips and places to check out. The food looks so yummy!